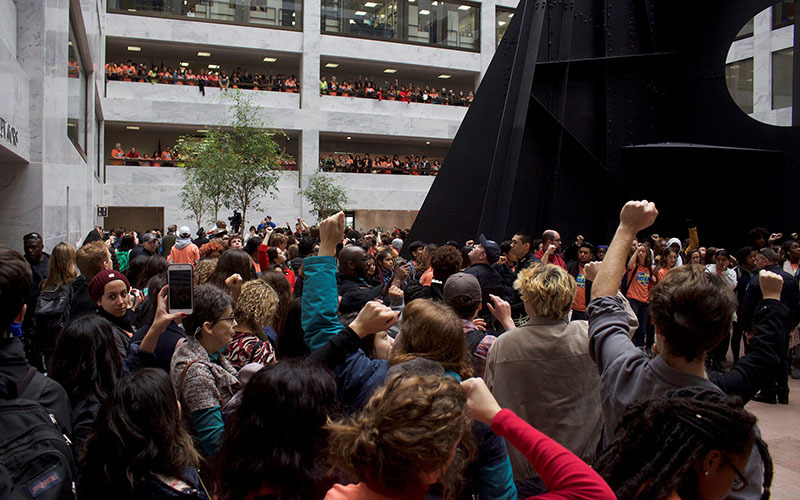 WASHINGTON – Hundreds of protesters packed the lobby of a Senate office building Thursday, their chants echoing off the marble walls as they demanded that Congress vote to protect DACA recipients. But while the protesters called for Congress to vote by early December on a “clean” Dream Act, with no other provisions attached, a group of Republican House members was calling for both sides to compromise on a bill to protect DACA recipients. 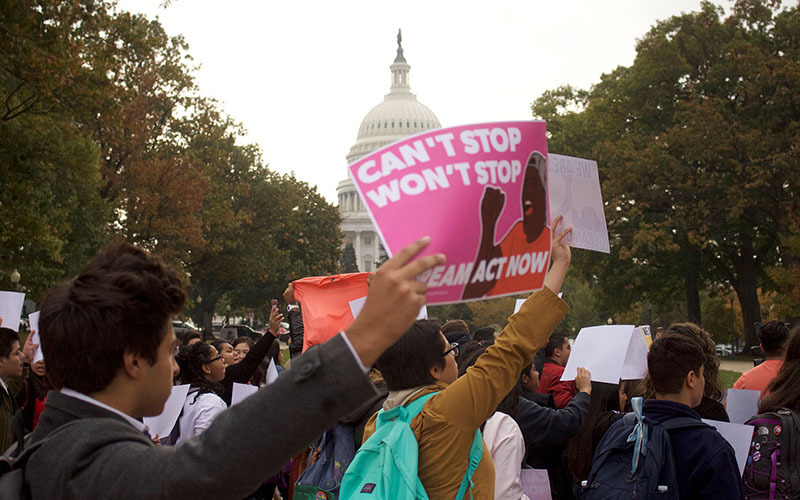 Their pending status was thrown into doubt on Sept. 5, when Attorney General Jeff Sessions announced that the Trump administration would phase out the Deferred Action for Childhood Arrivals program that had been a hallmark of the Obama administration. 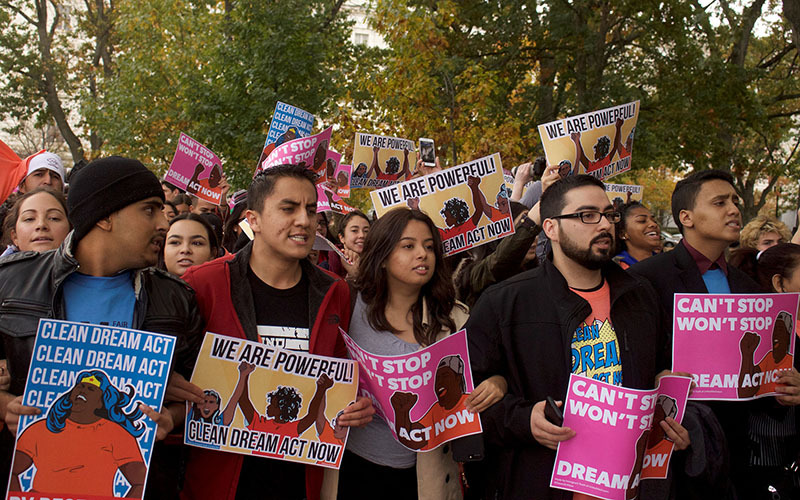 President Barack Obama established DACA by executive order in 2012, after Congress stalled on efforts to pass comprehensive immigration reform. Under the program, anyone who was brought to this country illegally as a child could apply to have their deportation delayed for two years, during which time they could get approval to hold a job and go to school. Supporters said it is wrong to deport someone to a country they may never have known and for whom the U.S. has always been home. But critics, including Sessions, called DACA an example of executive overreach on a decision that should have been left to Congress. Sessions said the Department of Homeland Security would no longer renew DACA protection after March 5, after which recipients could be subject to deportation. The six-month phase-out of the program was designed to give Congress time to come up with a solution. Despite proposals in the House and Senate that could keep DACA in place, however, Congress is no closer to a vote. And some Republicans, including President Donald Trump, have suggested that a DACA replacemtn will need to include other elements, such as funding for a border wall or greater immigration enforcement in the interior. 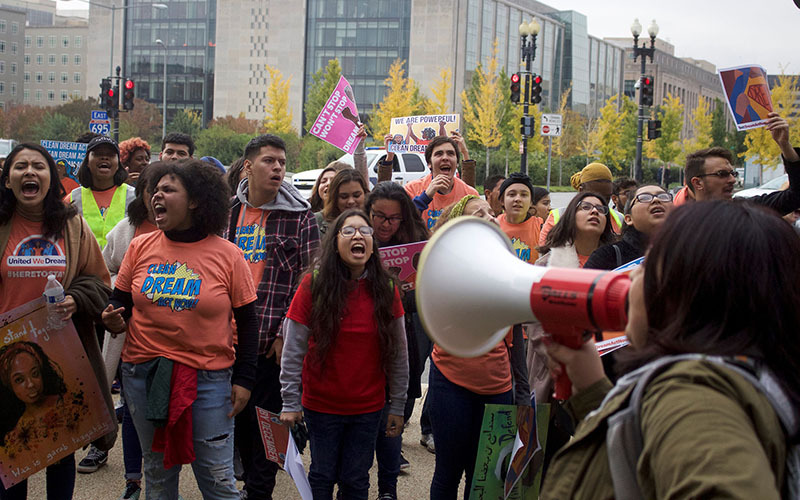 But protesters Thursday demanded a vote on a “clean” Dream Act – which would put into law many of the policies of DACA, along with a possible pathway to citizenship – and they want it by Dec. 8, when the federal budget will be up for a critical vote. “These are people’s lives,” said Karina Ruiz, president of the Arizona Dream Act Coalition. It was one of three Arizona groups to bring dozens of protesters to the Capitol to protest. 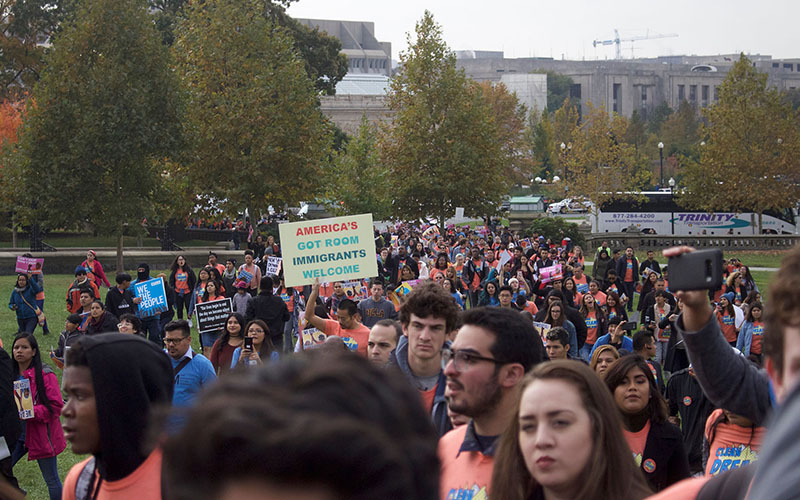 Protest organizers said they brought 1,000 bright-orange T-shirts demanding a “clean Dream Act Now!” but said they quickly ran out of shirts for a crowd they estimated to be about 1,200. 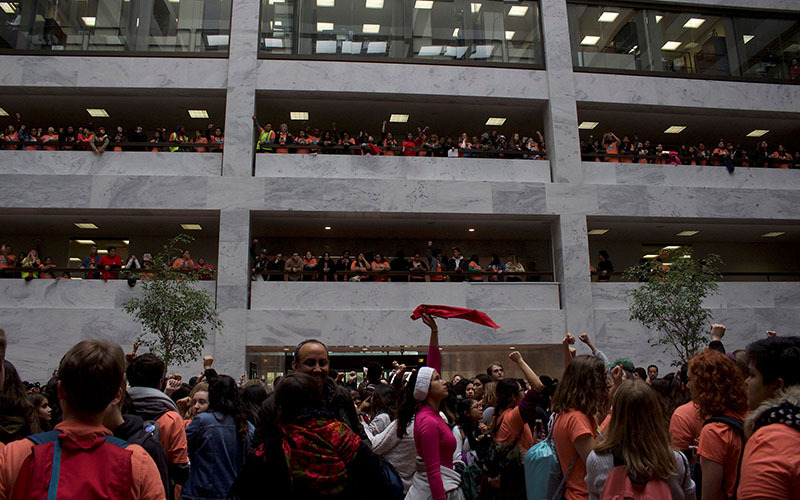 Protesters filled the atrium of the Hart Senate Office Building with a sea of orange shirts, with hundreds more lining several floors of balconies that ring the space. There were no speakers, but the crowd chanted and clapped, creating a deafening din in the marble-clad space. During the event, several protesters sat on the floor, linking arms and chanting. U.S. Capitol Police arrested 15 of them for obstruction and other charges, as the rest of the crowd began to file out. Belen Sisa, an Arizona State University student and DACA recipient who was among those arrested, posted bail and had been freed by mid-afternoon. After leaving the office building, protesters marched peacefully across the Capitol grounds, chanting and waving signs. They stopped at several points to demand action before ending up at the West Front of the Capitol. 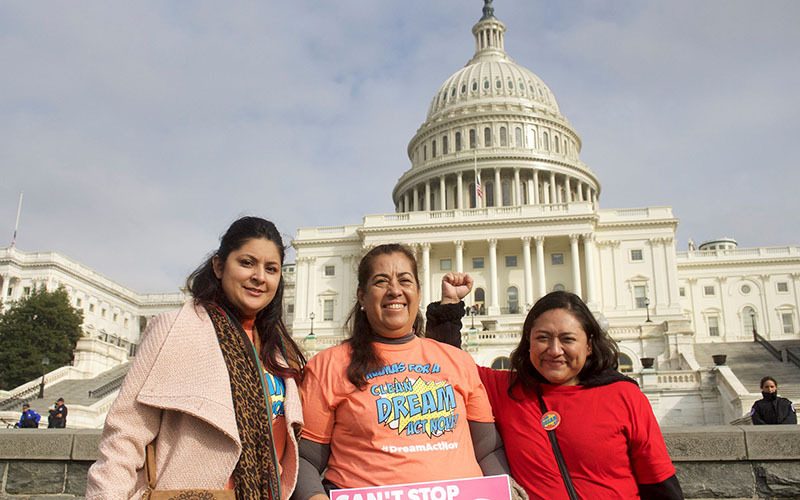 Rosa Maria Soto, 64, an undocumented mother from Phoenix, was there to represent her mixed-status family, carrying a handwritten note from her granddaughter to members of Congress. She said she is afraid of what could happen if Congress does not act. Ruiz said the Arizona Dream Act Coalition has been regularly holding demonstrations, organizing and reaching out to lawmakers. Not it’s time for Congress to “do their job,” she said.